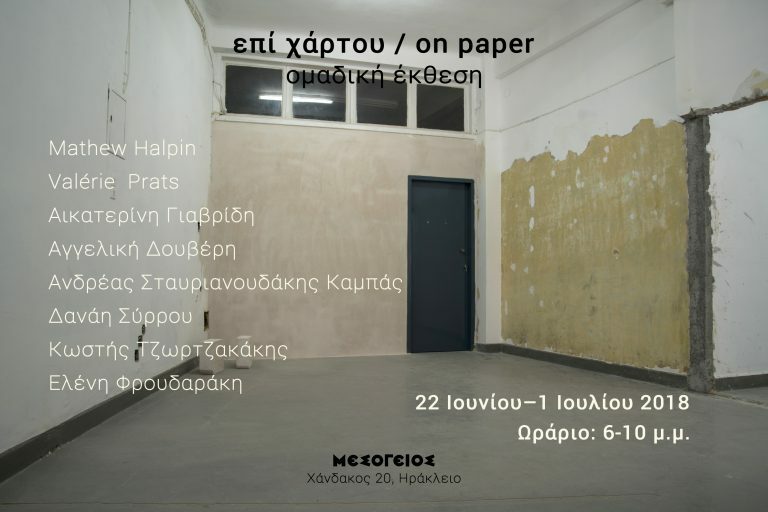 The exhibition Επί χάρτου / on paper gathers eight contemporary visual artists who present their works with paper as the main subject. The diverse and varying approaches among the artists who deal with paper as the material itself or as a mean and a symbolism towards new visual exploration and experimentation, suggest anew aspects and correlations respecting this all-time great material. Opening hours: Daily 6-10 p.m. Opening: Friday 22 June 8:00 p.m. The relationship between image and text has interested experimental filmmakers almost from the beginning of cinema. Different methods of combining film and language / poetry have been proposed and introduced as terms in various phases of the 20th century, such as the film poem, poetry film, film essay, the video poem, text film, etc. In each of these types/genres, filmmakers experimented with methods of combining verbal language and image, such as the use of text on the screen (a tradition that begins already in silent cinema and reaches its peak within fluxus films), the use of poetic voice over and spoken word (often with the poets themselves reading their own works), the idea of actual language translations to pictures, as well as the research of poetic forms in the cinema, ie the investigation of a concept of a more “vertical”, lyrical filmmaking form that reminds of the tradition of modernist poetry. In this collection of films we bring together for the first time feminist and queer film poems and film essays from Greece, as well as artists of the greek diaspora. The films we have collected may have significant aesthetic and methodological differences, but they all have in common both the expression of identity politics claims and the use of language / text at the core of the way they develop their communication structures. The series of these films is presented to accompany the screening of Antoinetta Angelidi’s piece “Topos”, a pioneering feminist work of Greek cinema from 1985, in a rare 35mm projection opportunity with English subtitltes. ATOPOS CVC inaugurates the #TextMe project, a year of actions and events on books and text in media arts in the context of UNESCO’s ‘Athens 2018, World Book Capital’. #TextMe was an original concept by Atopos artistic director Vassilis Zidianakis. Within this context, researcher Fil ieropoulos has curated #TextMe_Lab, a series of lectures, discussions, workshops and residencies of artists and academics at Atopos. The projects will revolve around the thematic of using text in artistic forms and interdisciplinary language applications. Some of the main points of interest of the programme are visual poetry, word and screen relationships, spoken word and the boundaries between poetry and sound art, as well as modern linguistic phenomena in online pop culture and new media. “Words speak louder than images” is the sixth event of #TextMe_Lab. 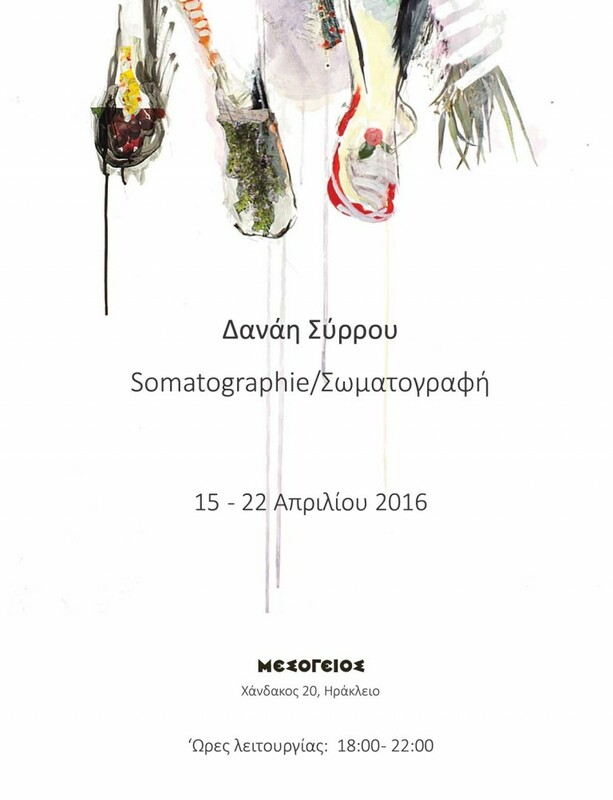 Επί χάρτου/on paper – group exhibition at Mesogeios, Heraklion Crete. 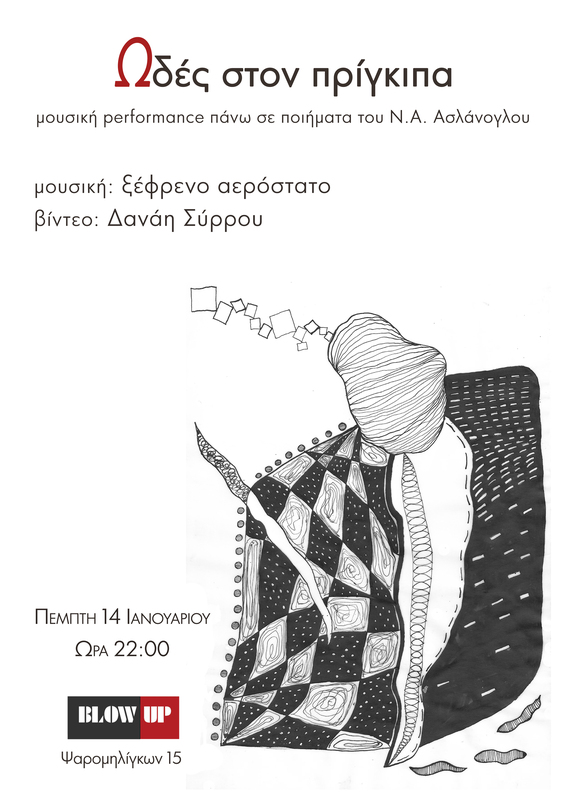 My works will be exhibited and will be for sale in low prices in the group exhibition SOLIDart for the financial support of the new refugees and immagrants space in Heraklion. At DiaRtiriteo, Theotokopoulou 14, Heraklion, Crete. Opening on Friday 23rd February at 7:00 pm. Duration of the exhibition: 23/2 – 3/3, hours: 5-10 pm. daily. 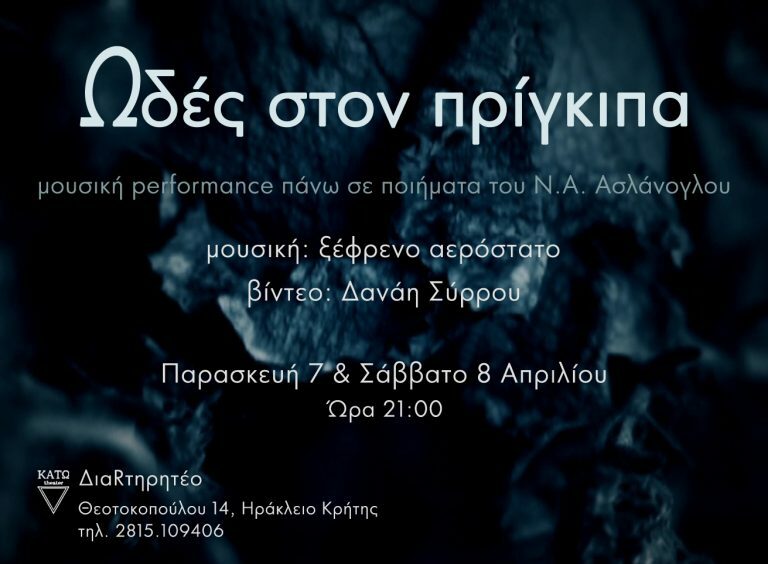 At the 7th and 8th of April, the “Kato” theater of DiaRtiriteo, Theotokopoulou 14, Heraklion Crete, will host the musical performance “Odes to the prince”. The performance was realised by Odysseas Grammatikakis as a part of his frantic aerostat project, with the collaboration of visual artist Danae Syrrou. 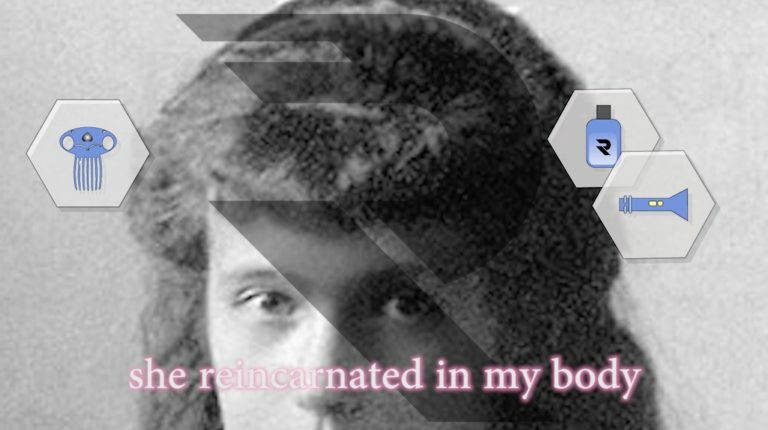 The work is based on poetry by Nikos Alexis Aslanoglou (1931 – 1996). The poems, characterised by subtle irony, loneliness, longing and desperation in mostly urban landscapes, are the motive as well as the main structural element of the work, in which the musician blends the poet’s words with the sounds of musical instruments, noise generators and everyday objects, creating repetitive patterns that sometimes remain uncertain and sometimes evolve to create full melodic structures. Danae Syrrou’s abstract video works are not simply images that accompany the sound, but essential elements so that the audience can transform the poet’s words into sentimental and spiritual journeys. A musical performance by musician Odysseas Grammatikakis as a part of his ongoing project “frantic aerostat”. In collaboration with artist Danae Syrrou, this is a work on poems by Nikos Alexis Aslanoglou (1931 – 1996), from his poetry collection “Odes to the prince”.